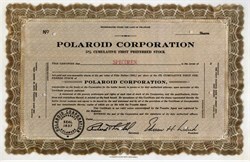 Beautifully engraved specimen certificate from the Polaroid Corporation printed in 1945. This historic document was printed by the American Banknote Company and has an ornate border around it with the company's name on top center. This item has the printed signatures of the Company's President and Founder, Edwin H. Land. This is the earliest certificate we have seen from this company. After Polaroid defeated Kodak in a patent battle, Kodak left the instant camera business on January 9, 1986. Polaroid developed an instant movie system, Polavision, based on the Dufaycolor process. The product arrived on the market when videotape-based systems were rapidly gaining popularity. As a result, Polavision was unsuccessful and most of the manufactured product was sold off as a job lot at immense cost to the company. Its underlying technology was later improved for use in the Polachrome instant slide film system. The company also was one of the early manufacturers of digital cameras, with the PDC-2000 in 1996; however, they failed to capture a large market share in that segment. They also made 35 mm and multi format scanners, such as Polaroid SpiritScan 4000 35 mm scanner (the first scanner with a 4000 DPI CCD) in 1999, and the Polaroid PrintScan 120 in 2000, the scanners had mixed reception and had heavy competition with Nikon and Minolta. All the line was discontinued after the firm went bankrupt. On October 11, 2001, Polaroid Corporation filed for Chapter 11 bankruptcy protection. Almost all the company's assets (including the "Polaroid" name itself, which had become almost synonymous with instant photographs) were sold to a subsidiary of Bank One. They went on to form a new company, which also operates under the name "Polaroid Corporation". It stopped making Polaroid cameras in 2007 and stopped selling Polaroid film after 2009, to the consternation of many users. The renamed "old" Polaroid now exists solely as an administrative shell. Its bankruptcy was widely believed to be the result of the failure of its senior management to anticipate the effect of digital cameras on its film business. On December 18, 2008, the post-reorganization Polaroid Corp. filed for Chapter 11 bankruptcy protection in U.S. Bankruptcy Court for the District of Minnesota. The bankruptcy filing came shortly after the criminal investigation of its parent company, Petters Group Worldwide, and the parent company founder, Tom Petters. On January 5, 2010, Polaroid partnered with Lady Gaga, appointing her as Creative Director for the company. A press release stated that she would be the "new face" of Polaroid. Since March 2010, instant film materials for vintage Polaroid cameras have again become available on the market, developed and manufactured by a group called The Impossible Project, at the former Polaroid production plant in Enschede, The Netherlands.